Emily Jane finished a clear winner without having to contest Saturday’s Listed Warstep Stakes, having won the Canterbury Belle Stakes and NZB Insurance Stakes and placed in the NZB Airfreight Stakes for a total of 18 points. Beyond The Fort , making her only appearance in the series, took equal second place on the table with the NZB Airfreight Stakes winner Secret Allure. Secret Allure didn’t add to her tally when she finished sixth in Saturday’s Warstep Stakes. Beyond The Fort (Niagara x Stella Rossa by Testa Rossa) was having her first start since finishing a gallant second in last month’s G1 New Zealand Oaks (2400m) at Trentham. Dropping back down in distance, Beyond The Fort sat back in the second half of the field before a flying finish down the extreme outside to win running away by two and a quarter lengths from Mohaka with Miss Valencia third. Beyond The Fort is trained by Bill Thurlow, who was at Randwick on Saturday to saddle his Auckland Cup winner Glory Days in the Sydney Cup. Thurlow is planning an Australian trip for Beyond The Fort for either the G1 Australasian Oaks at Morphettville on May 4 or the Queensland carnival. 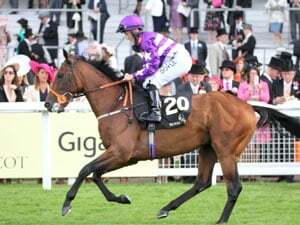 Beyond The Fort, raced by the estate of her late breeder R Stevens, boasts a very Australian pedigree despite the former Gai Waterhouse-trained Group 2 winner Niagara standing at The Oaks Stud in New Zealand. 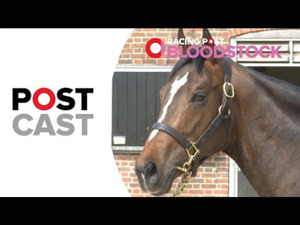 Beyond the Fort’s dam Stella Rossa is a half-sister to Singapore champion Prestissimo (Charge Forward) from a sister to G1 winner Bohemiath (Umatilla). Stella Rossa has produced four winners from five to race. Race Synopsis: This Listed 3yo filly only 2000m event saw the G1 NZ Oaks form demolish the Blacktype South Island form when Beyond The Fort buried her rivals today. In fact the race and result saw a North Island trained shut out, an eclipse almost, with the first six home all trained in the Central Districts. The winners and where they turned for home in race order were sixth (six-off the inside and two lengths from the leader), led (five-off the inside and head in front), fifth (six-off the inside and length and a half from the leader), led (three-off the inside and length in front), led (four-off the inside and a neck in front), fourth (ten-off the inside and length and a half from the leader), fifth (twelve-off the inside and three and a half lengths from the leader), led (ten-off the inside and half a length in front) and led (eleven-off the inside and neck in front). 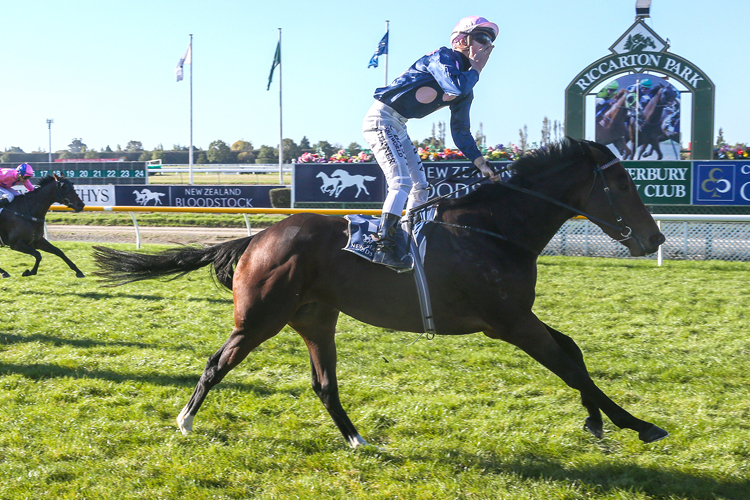 Beyond The Fort at her third ever start ran a solid second in the G1 NZ Oaks (2400M) at Trentham in March, in what was not an overly strong field or renewal of the race this year but it was light years ahead for a South Island Listed event, as it should be. The big filly sat back on the inner on an awful Riccarton track that was presented as a Dead6 but chopped out horribly straight away and every race ended up being steered to the middle of the track or wider the run home. The strength of Beyond The Fort saw her pierce through fifth before the home turn and she got angled wider turning in then she unwound powerfully to lead at the 100m, She ended up winning by almost two and a half lengths in 2:03.12 (the G3 Open at WFA race following this was run and won in the slower time of 2:03.18 to embellish her performance) to record her third win four starts and continue an amazing 2019 so far for her Waverley trainer Bill Thurlow. The key to this filly is rain-affected footing and being given time as she only debuted in February this year and now has a Listed win and a G1 second on her resume. Mohaka ran on gamely for second after racing sixth then fifth the inner and working off and wider before the home turn. Miss Valencia led then trailed then worked off near the home turn and fought well to hold onto third narrowly. Guillada sat outside the leader then took over before the home turn and was only over-powered with a 100m to go then she got swamped the final 25m to finish fourth. Platinum Rapper and Secret Allure the stablemates finished fifth and sixth with the former running on the closing stages and the latter weakening late after bolting in here one week ago. City Slicker was not bad in finishing seventh beaten six lengths as she was a last start maiden mile winner at Ascot Park and was the first South Island trained runner home. Musee D'Orsay was not too bad for eighth but beaten almost nine lengths and Sulu Sea likewise when ninth beaten nine and a half lengths. The rest got beaten over thirteen lengths and as far as twenty-two lengths with most either despising the footing presented or not being bred or able to run middle distance or they were outclassed. This was a modest at best Listed field and the best stayer by a long way won in Beyond The Fort and she is in a stable that prepares stamina types and takes their time importantly. Lots of winners out of the race back to their own grades in the South Island and for some once back home in the North Island but most of these will be spelling until next season or wanting wetter footing should they continue on. 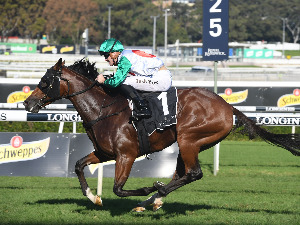 New Zealand colt The Chosen One enhanced his future stallion prospects with his classy win in the G3 Frank Packer Plate at Randwick on Saturday, extending the notable success the Dennis family have enjoyed with their homebred products. 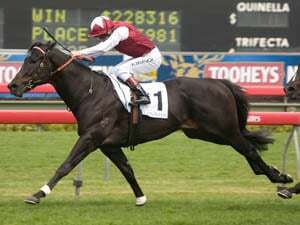 The first southern hemisphere stakes winner by Camelot contributed to a day of significant black type results for the Murray Baker/Andrew Forsman training partnership in Australia and New Zealand on Saturday.